People often quip that I’m a bit of a ‘supermarket wine basher’. I’m searching for exciting and delicious wines and, with few exceptions, I’ve yet to find these in a supermarket. Complexity is important too, but that doesn’t mean we must sacrifice drinkability – both can be harnessed after all. Ideally the wines will showcase and remain true to their origin, grapes, vintage conditions, and maybe even the grower – in winespeak terms a sort-of all encompassing ‘sense of place’ factor with the obvious question mark raised over the human element of terroir. It’s important that the wines represent good value for money, but that doesn’t always mean that they are cheap (unfortunately!). So how’s that for a list of subjective and nebulous criteria?! I’ll put my hands up, it has not always been thus, but that’s certainly what I’m looking for now. 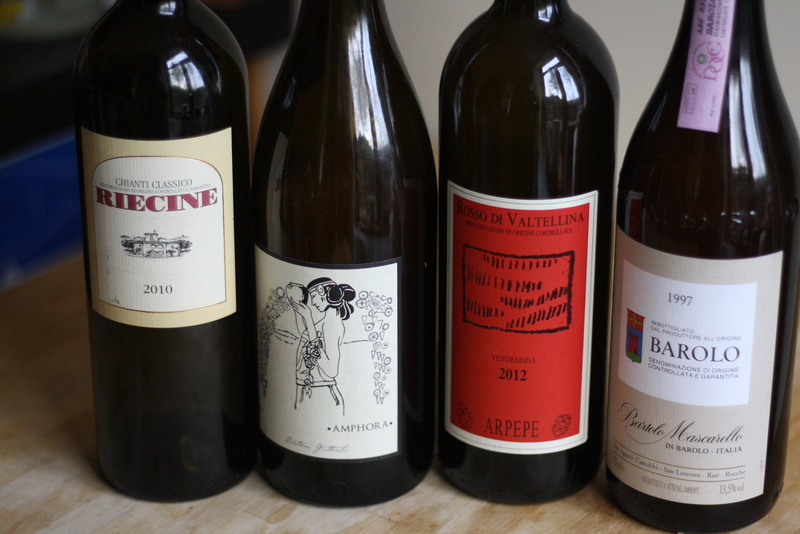 These wines don’t necessarily have to be from the most legendary vintages, nor do they have to be the supposed top wines from a particular grower, facts that were emphasised on a recent weekend where I seemed to luck-out with my Italian wine choices across the board. In fairness, there wasn’t much luck required at all, as I’ve enjoyed wines from all of these growers in the past. It all kicked off on a Friday evening with Cristiano Guttarolo’s Primitivo Amphora 2012. Well technically it started with a Sipsmith Negroni, but you get the drift. This was a ‘suitcase wine’ plucked from the shelves of Noble Fine Liquor in Broadway Market, London. Thankfully it had remained intact following a gentle massage from the baggage handlers at Heathrow. Cristiano’s vineyards are in Gioia del Colle in Puglia on a plateau approximately 400m above sea level. This is a wine whose appeal to me is built on texture and mouthfeel. It’s incredibly fresh, perfumed and light in both colour and weight; sweet and floral initially but still with a hint of wild red fruit character that I’m really enjoying of late. Just an incredibly exciting wine. A bottle of Riecine Chianti Classico 2010 followed, showcasing an impressive balance of Gaiole fruit concentration and minerality. The Riecine secret is well and truly out now that Jancis Robinson heaped praise on Riecine Chianti Classico 2011. I love Riecine’s expression of Chianti Classico – the 2008 Chianti Classico is a delicious wine that I’m hoarding a few remaining bottles of. I missed 2009 for some reason but stocked up on the 2010, which is drinking very well right now – it had sweet fruit on the mid-palate combined with racy acidity and a rustic edge that I really liked. I must try to find some magnums of this! We continued our virtual, and unintentional, journey northward over dinner. Any mention of the 1997 vintage in Barolo seemingly must now come with some sort of comment about it being a year that was lauded on release but derided with the passing of time. 1997 was hot, and it seems that many Barolos are drying out prematurely. Unsurprisingly, given the winery’s exalted reputation, a bottle of Bartolo Mascarello 1997 showed the folly of broad vintage generalisations – it had poise, aromatic lift, depth of flavour, elegance and excellent length. All this whilst only tipping the scales at 13.5% alc. Needless to say, the bottle didn’t last long. 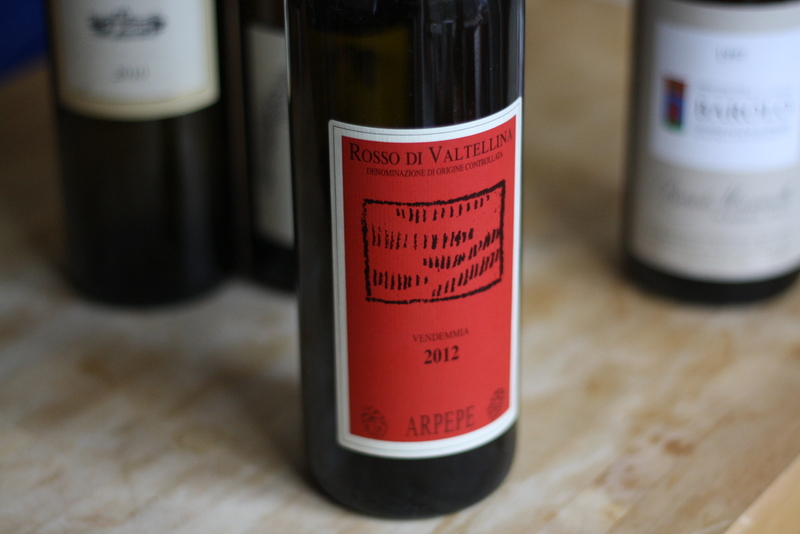 The curtain was drawn on the weekend with a bottle of ArPePe‘s Rosso di Valtellina 2012 (100% Chiavennasca or Nebbiolo) – another from Noble Fine Liquor to survive the Heathrow checked baggage gauntlet. I was doing a bit of Zalto experimentation all weekend, and in the Burgundy glass the herbal and mineral sides to this wine really came to the fore alongside that floral freshness that I enjoyed so much on my first tasting a few weeks ago. The rosso was incredibly moreish and drinkable, and I can’t wait to try my lone bottle of ArPePe Sassella Rocce Rosse 2001 (the baggage handlers in Rome having been just as gentle as those in Heathrow! ).